I was born December 7, 1919 a Hill City, Kansas. I started to school in 1926 and went to first grade in Hill City. The next seven years of grade school I attended Highland, a rural school 2 miles from home. Incidently, I lived on a farm. In 1930 my mother passed away, leaving Dad, Delmer (brother), Leora (sister) and me to ourselves on the farm. I graduated from grade school in 1934. Graduated from High School in 1938. I entered Fort Hays State College in 1938, fall semester. I attended Fort Hays three years and in 1941 when I finished my 3rd year, I went to Los Angeles, California to work for the summer, planning to return to school in the fall, but the Army thought they needed my services, so I was called into the Army November 3, 1942 and attended Technical Training school until May 10, 1942. Then I was sent to Roswell, New Mexico to training other personnel. There I met Mary Louise Everman and was married November 14, 1942. In March 1945, I was sent to Fort Lee, Virginia for overseas training, then in August, 1945, I went to the Philippine Islands as a Platoon Leader with 50 men in my Platoon. In January, 1946 I was returned to the States and discharged from the Army January 11, 1946. I lived in Roswell, New Mexico and worked at construction work, then moved to Kansas and purchased a farm. On December 15, 1946 Shirley Ann, the daughter was born at St. Anthony's Hospital in Hays, Kansas. On August 14, 1949 Ronald, the son was born at St. Mary's Hospital in Roswell, New Mexico. In 1954 I was able to rent more land and increase my farming operation. In 1963 we built a new house. In 1965 Shirley graduated from High School and is attending For Hays College as a Nursing student. Ronald graduated in 1967 and is now attending Fort Hays enrolled in a Pre-Med course. Ronald just finished serving a one-year term as a State officer in FFA which is a very high honor. He has been giving speeches to FFA banquets over the Western part of Kansas the past year, which has provided him with very valuable experience, as well as being paid for his time and travel. At present I farm 1500 acres and have over 100 head of cattle, so when Ronald finishes his first year of college this spring he will be busy helping me. Ronald farms 160 acres and has 25 head of cattle as well as some hogs. This has been my life, or part of it. I hope this can be read as my handwriting is not of the best quality, as you have now seen. Note by Phil & Hazel: The following was taken from the "Hill City Times" (June 1963) regarding the house built by Mary and Ralph: "Ralph and his wife and his brother-in-law, Ralph Billman did all the work on the home to keep down expenses; and the total loan ran to $10,000 to be repaid in monthly installments just like rent over a 40 year period. The home has 1250 sq. ft. of living area, including three bedrooms, 1 1/2 baths, a kitchen, living room, and a full basement. It is of wood frame construction, with masonite siding and dry wall interior. The basement was dug the last of August and the concrete poured the 15th of September for the foundation. Billman worked all the time, and Ralph and his wife worked on the house during ever bit of their spare time. A lot of night work went into the home, as Ralph had 300 acres of wheat to drill and his feed to cut during the period of construction. ....Ralph purchased the quarter the home is located on in 1949 from his grandfather's estate. He farms it, and then rents another 1000 acres from John Moore. He runs 50 head of cattle, 50 hogs and has 300 acres of wheat and 180 acres of milo planted. 'This operation seems to have kept the whole family busy,' Ralph said. ...In closing, the Quints said, 'it is like being in seventh heaven to live in our new home, and we are mighty thankful to live in a country where something like this is possible.'" 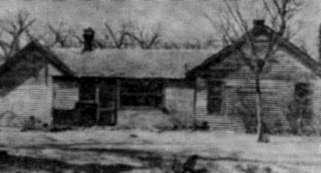 Photo of L. F. Quint farmhouse, which was torn down. Gandma Jackson came to live with her daughter.